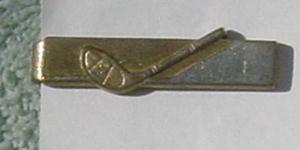 This vintage gold-tone and silver-tone tie clip has an elevated golf club on the front. On the back it says pat pend (patent pending). It's from a British model who got it from her grandfather.